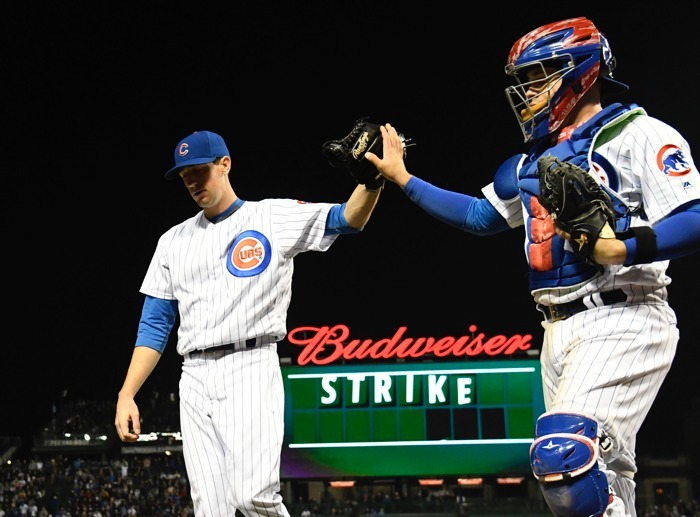 Can I Interest You in Some Chicago Cubs Rotation Positivity? Can I be positive for a moment? That’s still allowed, right? Can I even pull it off? 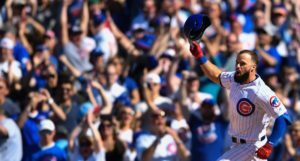 The bullpen and the offense get a disproportionate amount of our attention around here right now, and for good reason – those are areas that, either by their current construction or by their performance last year, leave us feeling like the Cubs could make significant strides this offseason to protect against serious downside risk. But lets set that aside for a moment and comment on two other phases of the game where it’s not terribly difficult to do the positivity thing: the starting rotation and the defense. Looking at this rotation pic at #Cubs dot com and it certainly strikes you how it is loaded with big names and the potential to be excellent. They will need it to be a strength. That, right there, is an entire rotation of guys who could be 3s or better next year. They are big-name guys who have all had significant big league success, and could well continue that success in 2019. 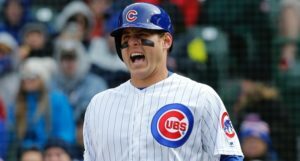 Big names, of course, aren’t everything, and it wasn’t so long ago that Cubs rotations that looked really impressive were being called things like the best starting group ever in Chicago. We know that the best laid plans can fall victim to aging and injury and command troubles and repeatedly short outings. In this group, Jon Lester and Cole Hamels are 35, and the decline could turn cliff-shaped at any moment. Yu Darvish is coming off a lost season and arm surgery. Jose Quintana was decent last year, but he’s dealing with velocity decline and uncharacteristic control issues. Kyle Hendricks is steady and solid, but his margin for error – if he loses *any* velocity or *any* command – is razor thin. There are risks here, of course. … but there’s also a lot of upside, even for a veteran staff. Lester and Hamels could just be really solid, crafty veterans who go near 200 innings, helping protect the bullpen. Darvish could finally be healthy, and could be even better next year having saved some bullets. Quintana, who only just turns 30 this month, could find that post-velo groove that very good pitchers do. Hendricks could keep being Hendricks. It probably won’t all be pristine in the rotation – not every perfect case will play out – but it also won’t be all bad. I like this rotation. Top five in the National League? Yeah, I could see that happening. And that pairs well with a defense that once again looks like it will be very strong. I see plus defenders at catcher*, first base, shortstop, center field, and right field, with no worse than average at every other position. That’s a tremendous defensive group, as they’ve shown to be over the past few years. That will, of course, only help the pitching. 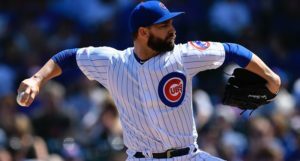 Having faith in the bullpen, of course, would also help the starting pitching, because it would be much easier for Joe Maddon to protect his aging starting pitchers (and, for example, let Jose Quintana stick to dominating the first two times through the order and not getting blown up the third time through). Right now, without some additions there, though, the Cubs will need some surprises to make that happen. Speaking of which, that’s kinda how good bullpens are supposed to work – a surprise veteran resurgence here, a conversion from a starting pitcher there, and a rookie comes up and breaks out. The Cubs certainly have the pieces for that kind of thing to happen, but it is necessarily not something you can bank on. So, then, I turn back to the rotation. I like it. It’s a good group of veterans, all of whom can be dominant, all of whom can also just be steady and solid. You’d still like to see a young guy or two emerge at AAA as very obvious and clear 7th/8th starter types (behind Mike Montgomery), but for a first five, this is a good group. There. Positivity. Just a little.